Stavanger’s Rosenberg Verft yard won the job of assembling the Draugen topsides in early 1990. This massive jigsaw formed an integrated structure, with components and equipment packages put together at the construction site. The topsides were originally intended for a floating production platform, which meant they were much lighter than a traditional complex used on a fixed installation. That in turn proved appropriate for a concrete gravity base structure (GBS) with a single support shaft, since it would keep stability during towout within safety requirements. The topsides were 79 metres long, 59 metres wide and 15 metres high (figure 1). Their quarters section was almost 23 metres tall and contained 130 berths. Standing in the water alongside the dock, these pillars were intended to imitate the shafts of the GBS which the topsides would rest on – as with the Statfjord and Gullfaks structures. However, the Draugen platform only had one shaft. In addition, the top of this monotower was larger than earlier points of contact and virtually square. That presented a challenge which had to be overcome before assembly work could begin. The answer proposed was a kind of both-one-thing-and-another solution. To accommodate barges to float the completed topsides to nearby Vats for mating with the GBS, two of the four concrete cylinders had to be placed at the seaward edge of the structure. These stood immediately beneath the quarters section, and were supplemented by smaller concrete blocks supported by steel tubes and positioned on the seabed to imitate the top of the monotower. Similar blocks were also spaced along the edge of the support frame to distribute the topside weight and thereby avoid damage. They could easily be removed to let the barges in (figure 2). The detail engineering job for the Draugen topsides had been awarded in 1989 to Kværner Engineering. Like MRV, this company was a member of the Kværner fabrication group. Covering the drawings used in tendering for and building the topsides, this contract was signed by project director Mahdi Hasan for Shell and senior executive Hans Jørgen Frank for Kværner. [REMOVE]Fotnote: Interview with project director Mahdi Hasan, 11 August 2018. This pair also put their names to the construction and outfitting assignment for the topsides when it was awarded to MRV in early 1990. Since both design and construction were to be carried out by companies in the same family, the prospects for a positive outcome looked promising. Computers at the engineering and fabrication firms talked the same language, allowing them to communicate. With such intimate collaboration, the job should have presented no problems. Nevertheless, this proved yet another offshore development where the design drawings were less than perfect – as had been the case in several projects off Norway during the 1980s. The latter had experienced major cost overruns, in part because of variation orders (VOs) during the construction phase. On Draugen, the flow of these amendments seemed endless. The yard faced problems dealing with all the changes to the drawings, with disruptions and discontinuities affecting assembly. Both time and costs became difficult to control. [REMOVE]Fotnote: Nerheim, Gunnar, Jøssang, Lars Gaule and Utne, Bjørn Saxe (1995). I vekst og forandring – Rosenberg Verft 100 år: 442-443. In fact, awarding these two contracts to companies in the same group may have contributed to the disagreements which arose during the construction period. [REMOVE]Fotnote: Interview with Sigbjørn Ellingsen, production vice president, Rosenberg Verft, 19 January 2017. The topside was originally costed at NOK 1.1 billion, but the bill had almost doubled to NOK 2.1 billion when Shell took delivery at the towout in February 1993. [REMOVE]Fotnote: Stavanger Aftenblad, 13 January 1996, “Pinlig for Shell, verst for Kværner”. MRV’s contract was a pure construction job. This meant that all proposals for variations from the design drawing – from minor improvements to major conversions – had to be approved by Shell. The Rosenberg yard accordingly sent such suggestions to the client, who then had to pass them to the engineering company for redrafting. However, Shell’s project team took the view that these proposals should go directly to Kværner Engineering and be sorted out between the two group companies. That approach would have been similar to the one used in the integrated engineering, procurement and construction (EPC) assignments which had become common in Norway’s offshore sector. This was precisely what Shell had envisaged and hoped would happen when it awarded both contracts to two companies in the same group. These two different interpretations of the contractual relationship meant that VOs piled up without being dealt with, and work at the yard was delayed by the absence of a response. Although this bottleneck was eventually resolved, a lot of critical time had been lost and it became important to speed up the remaining work. But disagreement over the contract persisted, and the final bill had to be settled by arbitration. This process dragged out, and took three years to bring to an end on 11 January 1996. [REMOVE]Fotnote: Stavanger Aftenblad, 13 January 1996, “Pinlig for Shell, verst for Kværner”. On behalf of the licensees, Shell had originally claimed NOK 1.47 billion from Kværner. This was later reduced to NOK 576 million. [REMOVE]Fotnote: Aftenposten, 13 January 1996, “Draugenseier til Kværner”. Shell based this demand on allegations of intentional or grossly negligent material breaches of the contract by Kværner, but these were dismissed by the arbitration tribunal. Kværner secured extra compensation of NOK 113 million because Shell had demanded an acceleration of the work, which meant the yard had to take on more personnel than originally planned. [REMOVE]Fotnote: Dagens Næringsliv, 13 January 1996, “Shell tapte mot Kværner”. Although the hearing ended in victory for Kværner, local daily Stavanger Aftenblad still headlined a comment by journalist Arnt Even Bøe: “Embarrassing for Shell, worst for Kværner”. He wrote that this case and others still to be resolved meant that the group had earned itself a reputation as the company which took legal action against its customers. [REMOVE]Fotnote: Stavanger Aftenblad, 13 January 1996, “Pinlig for Shell, verst for Kværner”. Interview with project director Mahdi Hasan, 11 August 2018. Nerheim, Gunnar, Jøssang, Lars Gaule and Utne, Bjørn Saxe (1995). I vekst og forandring – Rosenberg Verft 100 år: 442-443. Interview with Sigbjørn Ellingsen, production vice president, Rosenberg Verft, 19 January 2017. 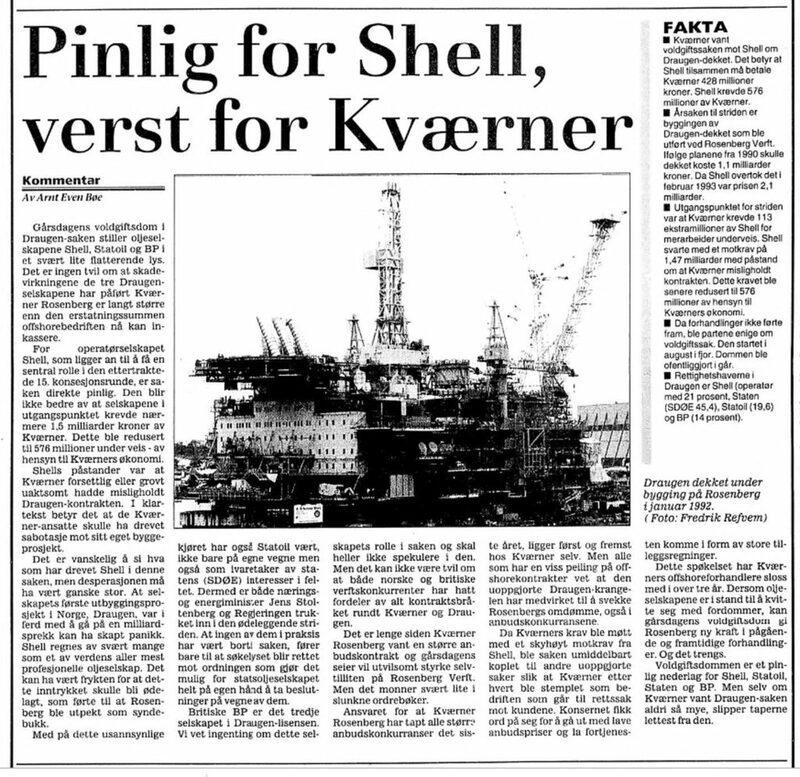 Stavanger Aftenblad, 13 January 1996, “Pinlig for Shell, verst for Kværner”. Aftenposten, 13 January 1996, “Draugenseier til Kværner”. Dagens Næringsliv, 13 January 1996, “Shell tapte mot Kværner”. A big battle was fought over the bill for fabricating the Draugen platform topsides at the Kværner Rosenberg yard in Stavanger. The dispute ultimately had to be settled by arbitration. Great emphasis was placed by Norske Shell on safety and the working environment when the drilling module for the Draugen platform came to be developed.